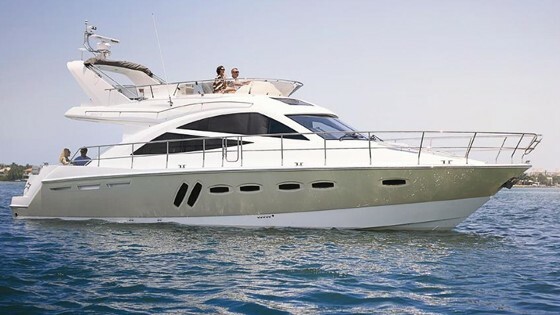 The new SC42i Sport Cruiser from Sealine marks the return of this company to the US market – and this boat will make a splash we will all remember. 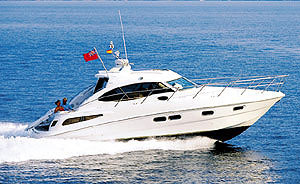 No one's going to accuse Sealine of being copy-cats, with the SC42i - few boats have such a unique look. Yeah, it certainly has one-of-a-kind eye-appeal. What’s more, it can change on the fly. 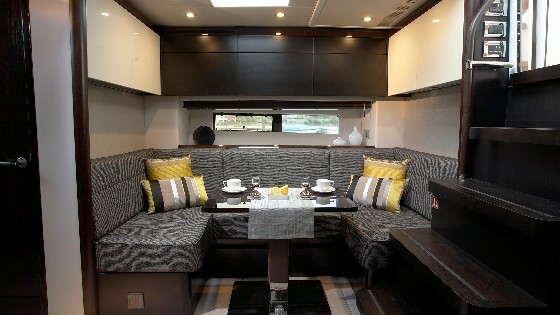 The entire bridgedeck roof retracts, the dinette table rises and lowers, and the cockpit furniture shifts and changes, all at the press of a button. 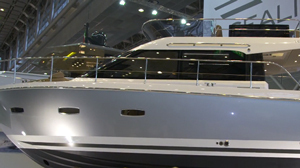 You can see the transformations take place in our Sealine Moving Parts video. 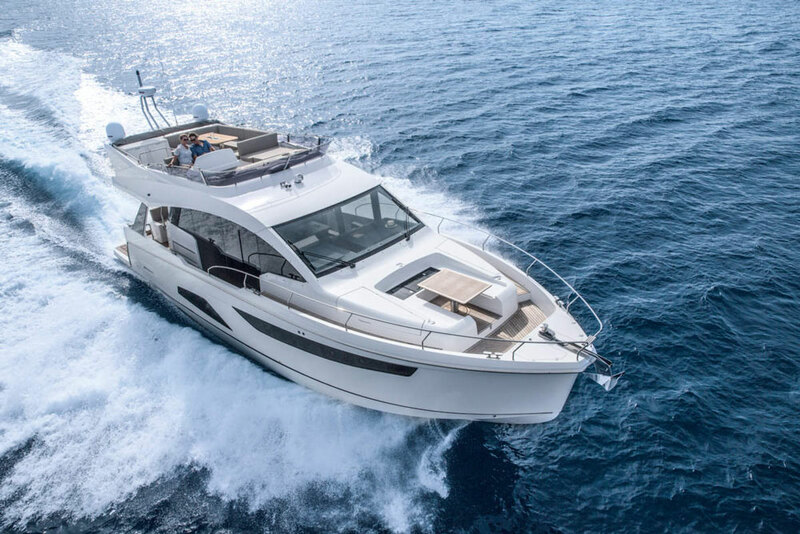 However you vary the configuration, one thing remains the same with the SC42i: no matter where you go on this boat, you’re treated to a healthy dose of natural light, ample elbow room, and fresh air. 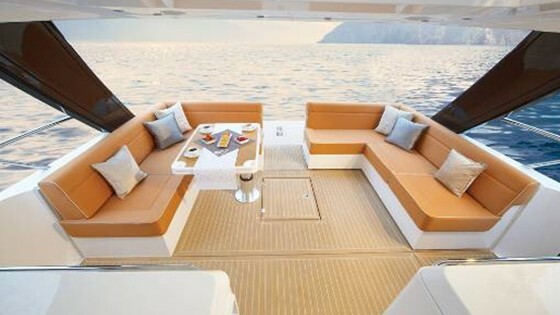 The bridgedeck is surrounded by windows forward and to the sides, and open air aft. Crank back that roof, and it’s like being in a completely open boat—except that if the weather turns you can enjoy the full protection of a cabin at the flick of a switch. PRESTO! You have a walk-through transom. The light, airy feel continues belowdecks, thanks to the use of multiple opening ports and overhead skylights. Contrasting darks and lights in the wood finish (you can choose between walnut, walnut/oak, or smoked oak), fabrics, and countertops complement each other, while again adding to the roomy yet modern feel. And since the cabin is set under a raised bridgedeck it feels almost atrium-like. You want a spacious feeling? It doesn’t get any better than this. Natural light floods the atrium-like cabin. Two staterooms, one forward and one aft (each with its own head), bracket the main cabin, which has the galley to port and a settee with a dinette (which converts into an extra berth) to starboard. The galley features the things we all love to enjoy in larger boats but rarely get to employ in a 42’ sport cruiser: a stand-up full-sized refrigerator/freezer, a three-burner cook-top, a wine chiller, and a dishwasher. But truth be told, you’ll probably abandon the cabin during meal time and instead, partake in an all-American tradition: grilling outdoors. 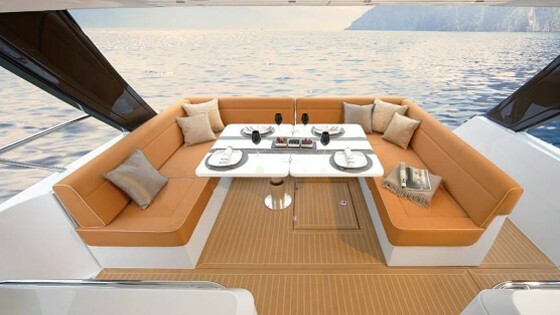 There’s a built-in bar-b-q in the starboard-side cockpit unit, which also houses another must-have for US-of-A-style entertaining, a wet bar. No matter how cool it looks and how comfortable it may be, a sport cruiser won’t cut the mustard if it doesn’t offer sporty performance. Equipped with a pair of Volvo-Penta D6 (435-hp) IPS pod drives, we cruised in the low 30’s and topped out right around 40-mph. That’s not exactly eye-watering, but it’s plenty sporty for most boaters. 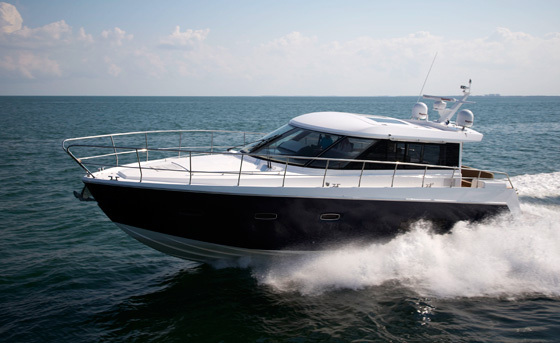 What takes the boat from sporty to super cool, however, is its handling. Throw down the hammer, and the SC42 jumps out of the hole. Crank the wheel over, and this hull grabs the water and carves. 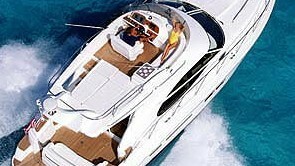 Then head for the dock, for some real fun. The end of our slip had a sea wall across from the pilings, which left only two or three extra feet of clearance to turn the boat around and back it in. No problem—twist the joystick, and the boat spins in its own length. Bump it backwards or forwards, and the boat eases in either direction. Push it sideways, and the boat moves laterally. With those joystick-controlled pods beneath the waterline, maneuvering into just about any tight spot is a piece of cake. Why haven’t we seen Sealines on this side of the pond for the past 10 years? Because of a marketing snafu; the company’s ownership thought these boats would compete with some of their other offerings, so they simply kept them out of the market. But now that ownership has changed, and a British-built boat has some things to offer which we don’t usually see in American-built boats. The full-height bowrails, for example, or a willingness to utilize space in a non-traditional way. 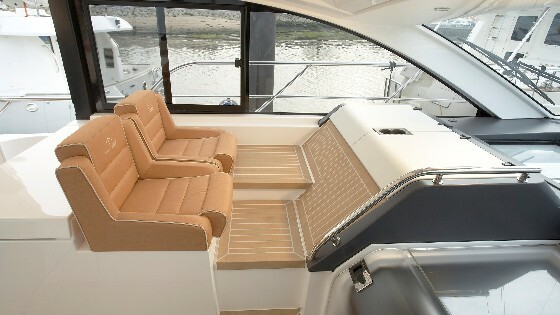 Just check out the passenger-side seating by the helm and you'll see what we mean. It’s elevated several feet over deck level to make room for that cavernous cabin below, and a foot-rest is built into the bulkhead. It looks very unusual, but plop down here while the boat’s running and you’ll discover it’s not only comfortable, you can keep an eye on the entire bridgedeck, cockpit, and foredeck. This spot gets even better when you retract the roof, stand up, and catch a face-full of salty air. They may look unusual, but trust us - these seats are not only comfortable, they also provide you with an excellent view of the entire boat. Of course, no boat afloat is perfect. So, what are the SC42’s downsides? All those moving pieces and parts may be nifty and convenient, but they’ll require additional maintenance. And the retractable roof is a soft-top, so at some point down the road, it will need replacing. Still, any way you look at it these are small prices to pay, for a boat that’s more than a mere sport cruiser—it’s super cool. 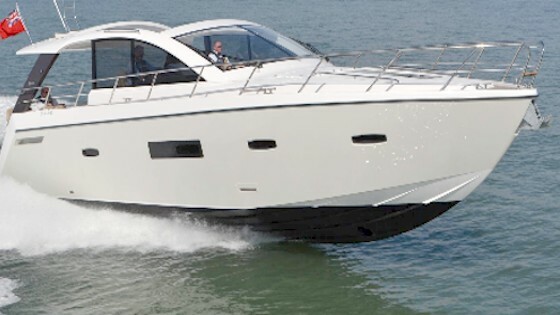 Other Choices: The Cruisers Cantius 48 has a similarly open, light, airy interior and cockpit. Pricing is close (both boats list at just under a mil) and it also runs on Volvo IPS drives.